At the age of two Orlando Otey was placed at the piano by his mother. It was 1927 and she had always hoped to have a son who would become a concert pianist. This young pianist went on to give his first concert at the age of four at the Teatro Iris1 in his native Mexico City. In 1940 at the age of 15 while on tour in Mexico giving programs of his own compositions that included several mazurkas, nocturnes and etudes, Otey was heralded as The Chopin of Mexico by critics and the press. Not only was his playing of Romantic music remarkable, his own works were taken by many to be compositions of Chopin, some critics quipping they were works that Chopin forgot to write. Aside from performing throughout his teen years Otey became a faculty member at the University of Mexico School of Music by age 17. He thereafter came to the U.S. and pursued piano and composition studies at The Curtis Institute of Music in Philadelphia in 1945. Otey studied with Gian-Carlo Menotti and Vladimir Sokoloff. In 1949 Otey was one of 3 pianists selected to compete in the Chopin Centennial Piano Competition in Warsaw, Poland (see New York Times clipping here). and became what Mexico City is today. who became known as “The Chopin of Mexico” by the age of 15. This CD is the second in a series of Chopin recordings by Pianist/Composer Orlando Otey. “Orlando Otey's CD is a performance of beauty and sensitivity. 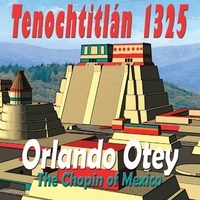 The title of The Chopin of Mexico followed Otey in the Press for years. 1 - Teatro Iris was built upon the site of the majestic Mayorazgo de Villanueva Palace in 1912. The theatre is just a few blocks away from the Teatro Lírico. The neo-classical façade matches the appearance of its neighbor, the old Cámara de Diputados or House of Representatives. However, the interior is more aptly described as Art Noveau, in harmony with the belle époque of the early twentieth century in Mexico. In 1917, the successful Tabasco artist Esperanza Iris bought the venue. On her death, it passed into the hands of the city's municipal authorities. © 2012 Ionian Productions, Inc.